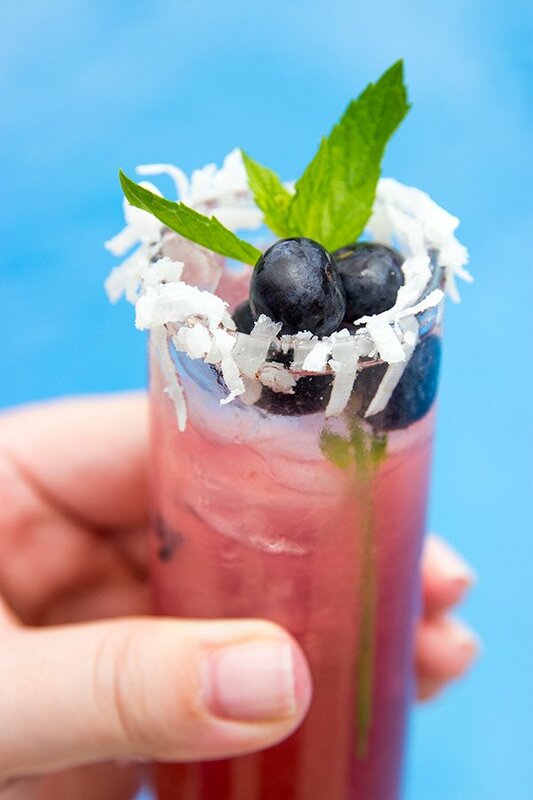 Summer is in full swing, so it’s time to cool off with this Blueberry Coconut Sparkler! 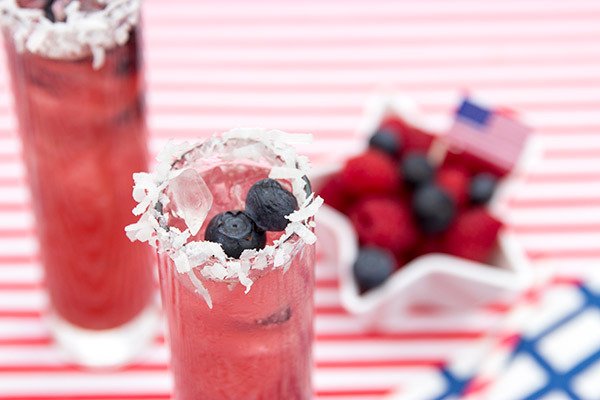 This drink recipe is refreshing and fun…and perfect for the 4th of July! Can you believe that Summer is almost officially here? Come this Saturday, Spring will be officially over, and it’ll be time to kick off Summer with a bang! Can we just talk for a minute about the dates when seasons begin and end? I don’t know about you, but I feel like Summer has been here for a while now…and I live in upstate New York. If you live down South, then you’ve probably felt like Summer began back in, oh, March. I guess the dates work for some parts of the world…just not where I’ve ever lived. Anyhoo, Summer is officially here, and that means it’s time to officially party! 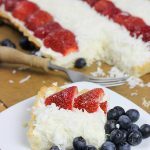 July 4th weekend is not far away now, so it’s time to start mentally arranging all of the awesome grilled foods and desserts you are going to have for the holiday weekend. But in your quest to plan the perfect party, don’t forget to make some festive drinks! I mentioned last week that I just got back from visiting my Mom and sister (and my sister’s new baby!) down in Nashville. While we were there, my sis and I decided that we needed festive drinks. (And since my sister just had a baby, who am I to argue with her!? She pretty much can have whatever she asks for these days!) 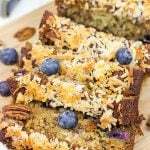 After a bit of rummaging around in the cabinet and a quick trip to the store for berries, this Blueberry Coconut Sparkler suddenly appeared in our hands. Don’t you just love it when that happens? So get out there this weekend and whip up a batch of these festive Blueberry Coconut Sparklers! Here’s to awesome vacations, the official start of Summer and hopefully a cruise! Cheers! Muddle the blueberries in the bottom of a medium bowl. Add the lemon juice and coconut rum; stir until well combined. Using a fine mesh strainer, strain the mixture and discard the blueberry skins. Add the ginger ale and gently stir until combined. Garnish rims of glasses with coconut flakes (optional). 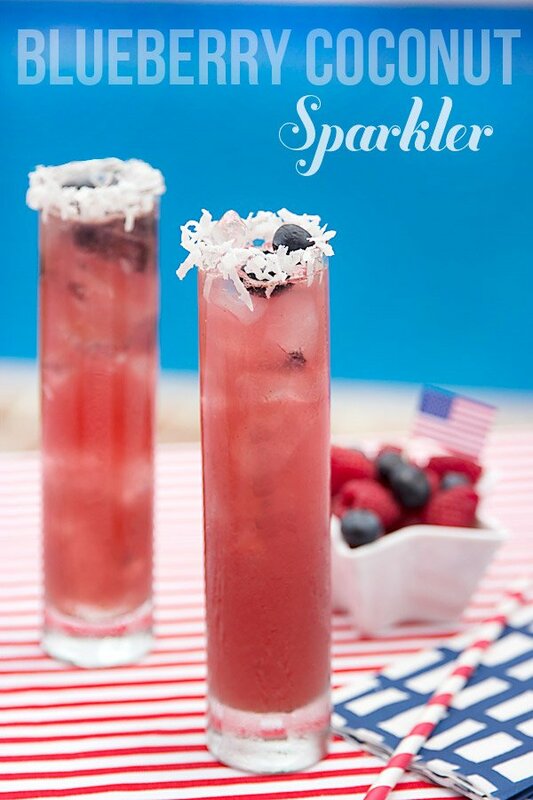 Fill glasses with ice and add Blueberry Coconut Sparkler. These look so refreshing! I don’t think I’ve had blueberry and coconut together in a drink before, but I bet they’re perfect together! Heh…thanks Mike! Spain v Chile will be a good one for sure, but did you forget about The Netherlands v the Socceroos at noon!?! I’m sobbing at my desk. I want a whole pitcher full of this… I want to get happy and sloshed! Its funny I’ve already had a couple of nights here were it seems crazy warm.. and we are waiting till 8:30 or later to take the dog for a walk (since she starts to die at anything over 75). So I agree dates don’ t matter. 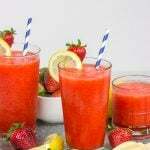 Loving this drink for any summer party, and winning that free cruise would be AMAZING! Haha…Gdog sounds like Mr. Max. He prefers nice, cool days…just no snow! And if you win that cruise, I want you to send me picks of all the tasty food on board. That way I can pretend I am there, too! This looks like the perfect drink to be sipping poolside the entire week prior to the 4th…It *is* a weeklong holiday isn’t it? Your post is so patriotic, I love all the colors! 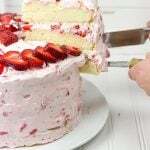 Also this recipe looks fabulous… can never say no to some berries! David – not only is your Blueberry Coconut Sparkler G.O.R.G.E.O.U.S. but this is such an awesome giveaway! Thanks for the link! Shashi, you are too sweet! Thank you!! I need you to win that trip. 🙂 Oh man, I do not miss the 90s and mosquitoes in Atlanta. We get that stuff up here…but only for like 1 week. Haha! I can imagine sitting pool side with a big pitcher of these bad boys. Especially since, you know… I have off all summer long and everything. Ahhh, 1 more week till summer vacation! 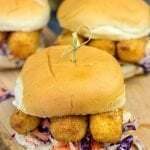 Then it’s #wolfpackeats all day long! Hello! Now you are talking my kind of drink. I love coconut! I don’t have any coconut rum on hand, but I do have coconut vodka. I’m already envisioning myself sitting and sipping one (or 2) of these. Pinning! Oh noes! I was pulling for England, too…it’s about time they got some luck in the World Cup. But I guess we’ll have to wait 4 more years. The US is kinda fun to watch…they’ve come a long way in the past few years, but I fear the competition may be a bit too steep for them, too. We shall see! This looks amazing David!! 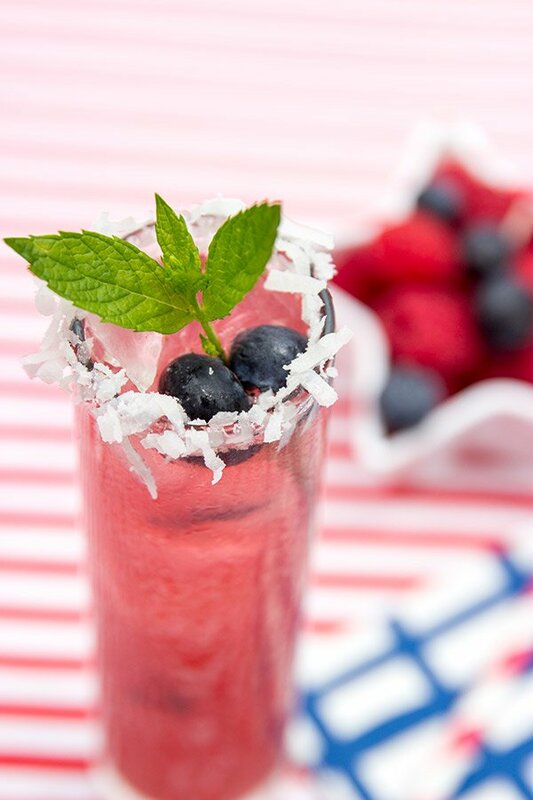 So refreshing and perfect for the 4th!! 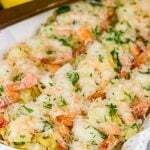 These look great and I’m making them for the 4th! Are they served in tall shot glasses?? Hey Janel! I actually used some really tall skinny glasses that I had picked up at World Market. (They’re about the width of a shot glass, but they are probably 4x as tall.) Truthfully, you could serve these in any sort of cocktail glass and it would be fine. 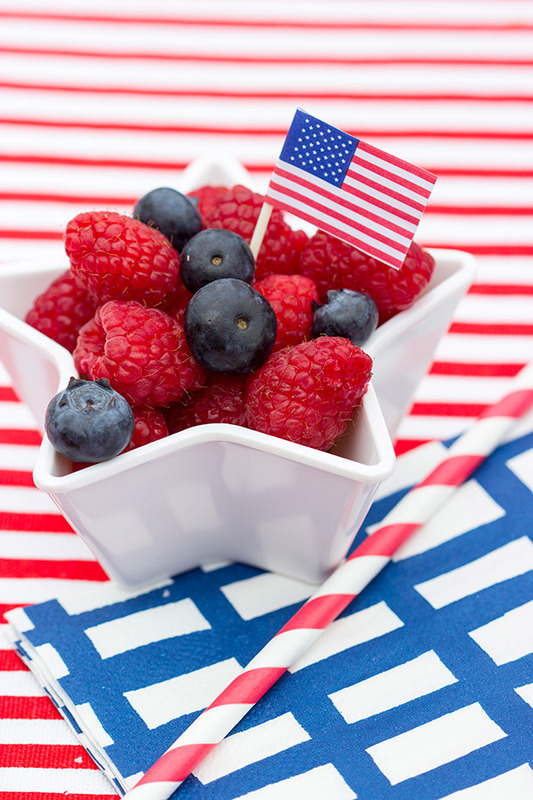 I hope you enjoy the drinks…and Happy 4th!! How many drinks does one recipe make? 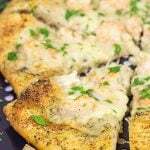 I skimmed through the recipe and comments and did not see that information. Sorry if I missed it! Hey Kat! I didn’t put the number of drinks on there because it all depends on the size of your glass. I would say you could easily get 2 drinks from every recipe, though. I used smaller glasses and got 3 drinks. A little leftover is never a bad thing when it comes to drinks, right? 🙂 Have a great long weekend…and thanks for stopping by!! Hey David! Thanks for the quick response! Hope you have a nice long weekend as well! Great, great drink! I brought it to a BBQ over the weekend where there was a drink off and we WON with this delicious drink!!!!! So, so good! I do have one question though…. how do you get the coconut to stay on the rim of the glass?? Thank you SO much, Stephanie…you totally made my day with this comment! 🙂 And I’m so glad you won…that’s AWESOME!! What was the prize?? Ah, and the coconut rim? Pour a little bit of light corn syrup on a plate and then turn the glass upside down and dip it in the corn syrup. Your coconut should stick wonderfully then!